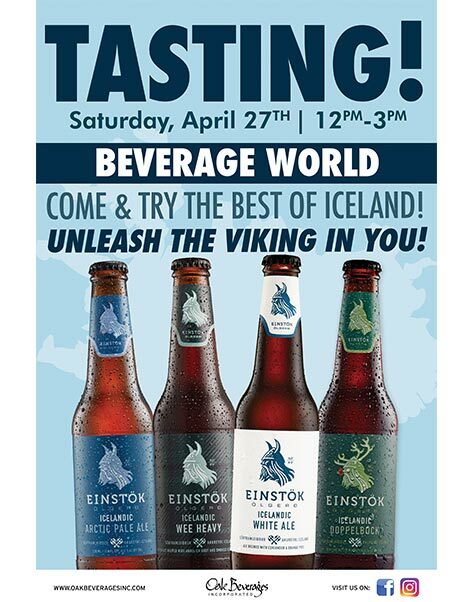 Einstok Tasting at Beverage World Peekskill - Oak Beverages Inc.
Einstok Tasting at Beverage World Peekskill, Saturday, April 27th, 12pm – 3pm. Try the best of Icelandic Beer and Unleash the Viking in you! Beverage World has been in business since 1992 providing the best selection of adult alcoholic beverages and alternative beverages anywhere in our area. Visit us today at 1719 Main St. in Peekskill, NY and give us an idea of what you’re looking for! And remember, if we don’t have what you need available in stock, we can definitely order it for you! Beverage World stocks a large variety of craft beers, import beers, Growler Station options, kegs, ciders, alternative beverages, specialty sodas, and gluten-free beers to ensure that we have something for everyone. Also, for December only, purchase any 12-pack of Goose Island products and receive FREE glassware! Posted in Featured Promo, Tasting Event.